FORT RUCKER, Ala. (May 1, 2017) - Editor's note: The following article is based on an actual motorcycle accident. All names and some details of the accident have been changed to protect the privacy of the individuals involved. Sometimes you'll hear a new rider rationalize buying a powerful sport bike with the philosophy, "I might as well buy what I am going to end up with." However, lacking the experience and maturity to ride these machines safely, new riders could end up dead on the road beside them. Staff Sgt. Edward Knight saw the police cruiser's flashing lights in the street's oncoming northbound lanes. He'd opened up his 2015 Suzuki Hayabusa after pulling away from a stoplight and was doing 70 mph on a 35-mph city street. This could be a big-money ticket. He looked over his left shoulder, checking if the cruiser had turned to chase him. Officer James Farrell had clocked Knight at 70 mph and flashed his lights, warning him to slow down. He couldn't give chase, as he was transporting an arrestee in the backseat. In his rearview mirror, Farrell saw Knight looking back. What he saw next, though, he will never forget. The events unfolding in Farrell's rearview mirror had begun two days earlier. Knight's unit had conducted a no-notice private motor vehicle inspection before the three-day weekend. As Knight went through the inspection lanes, an NCO asked him if he had a motorcycle. He replied that he'd bought a Hayabusa four months earlier. Knight's first-line leader, Sgt. 1st Class James Noble, knew about the bike, as he'd ridden it from the dealership to Knight's home. Knight had completed his Motorcycle Safety Foundation Basic RiderCourse 18 days before buying the bike but wasn't comfortable trying to ride it home from the dealership. He had his license and insurance, but it wasn't until the PMV inspection that his company commander and first sergeant learned he owned the bike. Before leaving for the long weekend, Knight provided copies of his MSF training certification, license and insurance to his unit. That evening, Knight picked up a friend, Sgt. Tim Lawler, and brought him back to his apartment for a barbecue. Lawler's car was in the shop for repairs, so Knight lent him his car to use in the meantime. After all, Knight had his bike as backup transportation. He typically used it for short runs around town, especially during good weather. The next day about noon, Lawler dropped by Knight's apartment and picked him up. The two had lunch and did some shopping. They returned to Knight's apartment about 5 p.m., where Lawler dropped off his buddy and drove home. Roughly an hour later, Knight got on his motorcycle and rode to Lawler's apartment. There, he planned to meet a friend, Gina Moore, and go out to dinner. Moore arrived about 6:15 p.m. Since it was more convenient to ride in her car, Knight parked his motorcycle and left his helmet and riding gear inside the apartment. Lawler had separate plans to go clubbing with friends from his unit. When Knight called him later to see if he was home, Lawler was headed to another club and described where he'd hidden his spare apartment key. Knowing where the key was, Knight could retrieve his helmet and riding gear from his friend's apartment. It was about 12:30 a.m. when Knight and Moore arrived at Lawler's apartment. For whatever reason, Knight decided not to pickup his helmet and riding gear. Mounting his motorcycle, he left for his place with Moore following in her car. The drive took them through a fairly well-lit commercial part of town, where they stopped for a red light. Knight was in front and, when the light turned green, rapidly accelerated down the street's southbound lanes. He'd gone about 600 yards before passing Farrell's police cruiser in the oncoming lanes and seeing the officer flash his emergency lights. Knight glanced over his left shoulder to see if the officer had turned to follow. He was still looking back when the street gently curved to the left and his front wheel struck the curb. In his rearview mirror, Farrell saw the Hayabusa's tail light come on briefly as Knight hit the brakes, but it was too late. The rear wheel came up as the bike began tumbling end over end with Knight still onboard. The bike and rider hit a street sign, shearing it in half before slamming into a pair of vans on a rental lot. The impact threw Knight off the bike and onto the street's right lane. Unprotected by a helmet, his head suffered massive trauma as it struck the vans, sidewalk and street. It was only 107 days since he'd bought the Hayabusa. Now he lay dead on the street just 14 feet away from it. • Knight diverted his attention from the roadway while riding at high speed. • He operated his motorcycle while impaired by the effects of alcohol (his post-mortem blood alcohol concentration was .11). 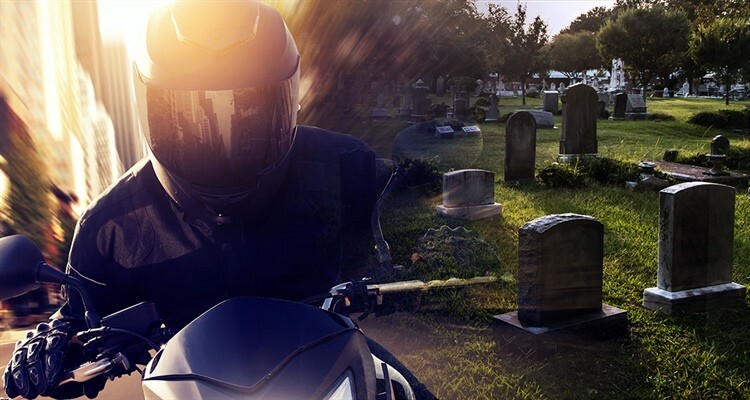 • Although his first-line supervisors knew he had a motorcycle, they never formally engaged him about the requirements for safely operating it, including always wearing his personal protective equipment. • Lacking a helmet, he suffered injuries he could not survive. How can we prevent accidents like this? • A high-performance sport bike is a poor choice for a first motorcycle. The learning curve is too steep for new riders to survive their mistakes and learn from them. • Soldiers should never operate their motorcycles or drive PMVs after drinking. • Speed kills by increasing impact severity and reducing reaction time, especially when the rider is distracted and fails to see a problem until the last second. 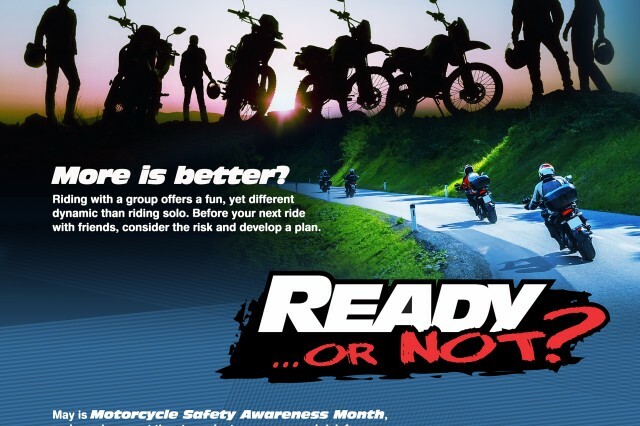 • Regardless whether they own a motorcycle, leaders need to know the requirements for safe motorcycle operation. First-line supervisors must enforce the standard for their Soldiers and set a positive example on and off duty. • Wearing protective gear is not an option. Regardless of state laws, PPE must be worn 24/7. 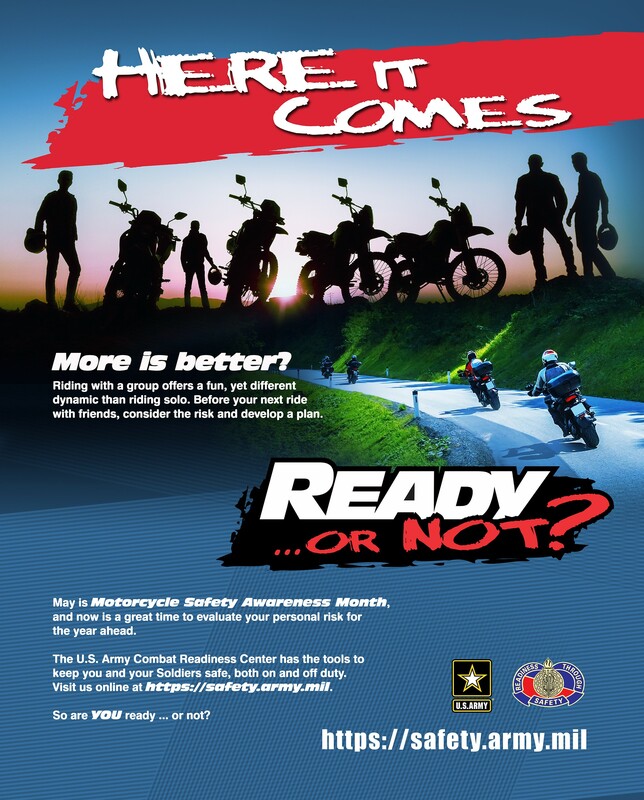 The National Highway Traffic Safety Administration designated May as Motorcycle Safety Awareness Month and each year, we provide the Army with multimedia products, https://safety.army.mil/OFF-DUTY/PMV-2.aspx, designed to augment NHTSA's efforts. These products can also assist leaders and safety professional in building their motorcycle safety programs. 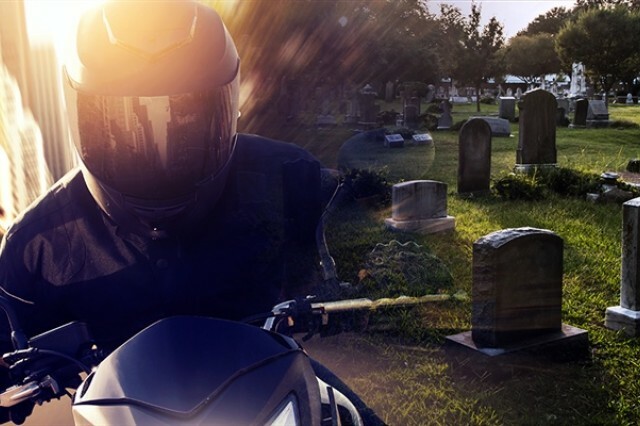 Commanders and leaders, check out our updated Commander's and Leader's guide to Motorcycle Loss Prevention - https://safety.army.mil/OFF-DUTY/PMV-2/InformationforLeaders.aspx. Leader emphasis is a corner stone to an effective unit-level motorcycle safety program. Each of you are an integral component of Army safety; your proactive efforts and discipline have gradually shifted and strengthened the Army's safety culture, resulting in fewer accidental losses. However, there's still work to do and the U.S. Army Combat Readiness Center stands ready to assist.